As much as fire and food, water is found everywhere in Twin Peaks. It is even where one would least expect it – hidden in the names of the characters. But before analyzing this aspect of the show, first I’ll focus on other water motifs. What is water? What does it do? “Scientists may call it an ‘essential substance’, which can be solid, liquid or gaseous, providing the main constituent of vegetable and animal cells as well as crystals and many minerals… all of the strange and important characteristics of water arise from the configuration of the three atoms in the molecule and the distribution of electrical charge among them… enabling it to serve as an almost universal solvent” (all quotes by Helen Valborg, from HERMES Magazine). Constantly moving, “it is an archetypal symbol for transmutation“. With water, we are once more brought to the world of Alchemy. Water is the solvent which enables the transformation of (mental) lead into gold. “Water lubricates every aspect of the wheel of life“. The process of individuation needs it so as to reach its “golden” destination. Without water, there is no life possible (of the body and of the mind): “Water is always feminine, the ‘Mother’ out of which all life comes. She is Chaos, primordial substance, and Gangetic flood… The Secret Doctrine tells us that hydrogen was the earliest existing form of matter and, together with oxygen, it instills the fire of life into the Mother through the process of incubation… This echoes the occult teaching about ‘the Fiery Wind’ whose ‘fire’ may be traced on a more phenomenal plane in the combustion of hydrogen by oxygen”. Water, fire, wind… All of this should sound very familiar to any Twin Peaks fan. When BOB – often associated with the (fiery) wind in The Secret Diary of Laura Palmer – gives his victims to the river (a symbol of fertility and the irreversible passage of time: “the inexorable repetitiveness of the water’s movement imbues one with an impression of timelessness“), he might very well be “instilling the fire of life into the Mother”. The ritual sacrifice he commits in doing so is able to generate an offspring, a crop: Garmonbozia. But where does water come from and where does it go? “We see the waters as they emerge but we are often ignorant of the unseen developments that engaged them when they first percolated into the earth’s rocky structure” (here, I’m tempted to add: “There was a fish in the percolator!“). In Twin Peaks, the waters might very well originate in the Lodges (at least from a symbolic/metaphysical/noumenal point of view). The Lodges appear to be closer to Unity, to that place at the roots of the Cosmic Tree from which the phenomenal world emanates. The floor of the Lodges with its chevron motifs is a visual reminder of their watery essence (this becomes even clearer in the new episodes we are seeing unfold in the third season) – they are the place of the “ocean of consciousness” dear to David Lynch and Transcendental Meditation. This can also be understood from a psychoanalytical point of view in that waters originate in the unconscious, at the root of the conscious mind, the place where archetypes – which can be associated with Lodges entities – reside. As for the place where these waters flow now, first, they become a river that cascades downward near the Great Northern Hotel (in a process that reminds us of the collision between the Fourth Dimension and our reality – more on that in a future post: Cube falling through a plane) before ending their course in the Black Lake. “The name ‘river’ comes from rivus or rive, indicating ‘a splitting asunder’… the river literally divides the earth… symbolically it divides the world of the living from that of the dead“. A good example of this would be the River Styx, in Greco-Roman mythology. It is clear in Twin Peaks that once a body/log is fed to the river, that person never comes back to the world of the living. It enters a new dimension. This is what happens to Laura Palmer. She is washed ashore on the banks of Black Lake, a Lady of the Lake of sorts – Arthurian mythology is not far below the surface of Twin Peaks. Links to Glastonbury are actually discussed in the last episode of season 2 and the Bookhouse Boys’ patch with its sword in a tree can also be read as a reference to Arthurian lore. Dale Cooper, knight to “Laura of the Lake”, follows her into the body of water towards the Red Room. “The critical factor distinguishing a lake is that it is completely surrounded by land, with no direct communication with the sea” (one could even say that it’s an “Inland Empire” of sorts…). In Twin Peaks the ocean (of consciousness) is where everything starts, where one catches “big fish”. Black Lake is downstream from that primordial ocean, down the path of duality. “For many people water has always suggested a connection between the superficial and the profound, a transparent, fluidic mass which conceals and yet reveals the way to another world. The lake embodies this in its fearful depths as well as on its glittering surface. It is profoundly feminine, being the humid spawning place of monsters and magical female power, and yet the image of self-contemplation, consciousness and revelation…. sometimes becoming the means of transition between life and oblivion, form and formlessness, solidity and fluidity“. In that sense, it can be understood as a mirror of the mind, as the reflections on its surface during the original opening credits of the series indicate: “It is a mirror into which the mind is readily drawn to receive a broader picture of reality. In its water the past lies alongside the present and the above is mirrored in below. Atomic particles float freely to shape images known only in other worlds, and long-forgotten memories surface to float for a moment beside embryos of ideation in their pre-natal state“. This special relationship to time is of course highly reminiscent of what happens in the Lodges. Not all rivers end up in a lake, though: “Some believe that the Ganges enters Patala, the nether world which is no end but only the other side of the cycle of life and death“. 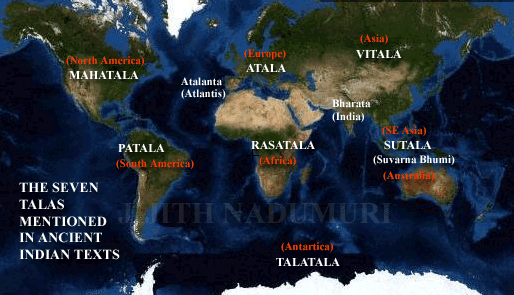 Interestingly enough, some argue that Patala (the subterranean realm situated under the earth in Indian religions) might be found somewhere… in South America, the continent where Buenos Aires is situated and where agent Phillip (friend of horses) Jeffries (territory/foreign/hostage – peace) mysteriously disappeared in 1987. This connection between water and what lies below the earth (usually associated to magma, or Hell) can further be explained by the fact that H2O is sometimes described as “liquid fire”: “Water quenches fire but we are taught that water is liquid fire. Light, flame, heat, cold, fire and water are the ‘progeny’ or correlations of electricity, the web of the One Life itself… The progeny of electricity are infinite. Foremost is fire as creator, preserver and destroyer, then light which is the essence of the divine ancestors, and flame, which is the soul. Light incubates water which fuses with earth, as Moses taught, to bring a living soul. Light and flame in and through fire and water receive, conduct and dissolve, at each stage of the manifesting triads“. One can actually visualize the process of water being turned into fire (though, fundamentally, they are thought to be one and the same) in the new credits of Twin Peaks, all of this being the result of the (watery and fiery) electrical flow which then appears on the floor of the Lodges. So, in a way, one could say that water, fire (should we say instead: the fiery wind?) and electricity are “one and the same” (remember that cryptic and famous line from the last episode of season 2?). Here is another quote which sums up what one needs to keep in mind when water appears in Twin Peaks: “Water symbolizes transmutation, the ocean of the unconscious, the abyss of mystery and intuition. It is a veil of the One Fire of Atman, a mediator between life and death, with its positive and negative flow of creation and destruction. The entrance to the Spirit-world is typically described in terms of crossing a river or immersing oneself into a body of water“. Once caught in a stream, one should be careful about the treacherous currents which could drag them under the water. In relationship to what was just said about Patala as the underworld / the southern hemisphere, it is interesting to read the following lines which connect the watery element to another recurring motif in the films of David Lynch, the spiral: “To its north (the belt of the earth) water drains in a spiral, moving counter-clockwise, while to its south it does the opposite. The counter-clockwise motion signifies the fall of spirit into matter, whereas the opposite represents its ascendance… As a river ceases its youthful rush downhill, drawn on by gravity, the combination of forward and sideward flow produces a spiral movement… the river’s current assumes the same serpentine pattern that describes the movement of all manifested energy“. Returning to the idea of water hidden in the very name of the characters in Twin Peaks: the names there are not chosen randomly, they are vectors of meaning (just like water, in a sense). An etymological approach to these names is enlightening concerning what they are supposed to represent in the show, beginning with Laura Palmer’s name, analyzed earlier on this blog and in my book as well. How about Annie Blackburn? Annie stands for “grace”, but Blackburn means “dark-colored stream“. Then we have Norma Jenning’s new father (featured in Mark Frost’s book, not the same one as in the original series, which might explain the absence of Annie): Marty is derived from “Mars”, the god of war) and Lindstrom from “linden stream“. Beverley Paige, Ben Horne’s new assistant, means “beaver stream” and “young helper”. One can also list Ruth (“sorrowful”, which might explain why she was killed) Davenport (“harbor on a trickling stream“); Douglas Milford’s given name stands for “dark water” (this might also explain Agent Cooper’s interest in Douglas firs); and of course there is Dougie Jones (“John’s child”, with another slang-like meaning linking it to addiction –> Cooper indeed becomes a child again when he becomes Jones). I’ll conclude by quickly mentioning another sort of water, tears: “May the disciple who would seek Nirvina light within himself the golden flame of Akashic Fire…. May he build high the fire of tapas within him until his pain and longing are converted into sweet and compassionate tears that may flow in abundance for all humanity“.